Once again it’s about that time everyone, it’s Fight Night! (Excuse this post being just a little early as I have a wedding to go to tonight and then a quick turn around tomorrow afternoon) After a few confusing weeks of opponent changing due to injuries, it’s Iaquinta and Hallmann filling the spot on Saturday’s Fight Night 30 card. 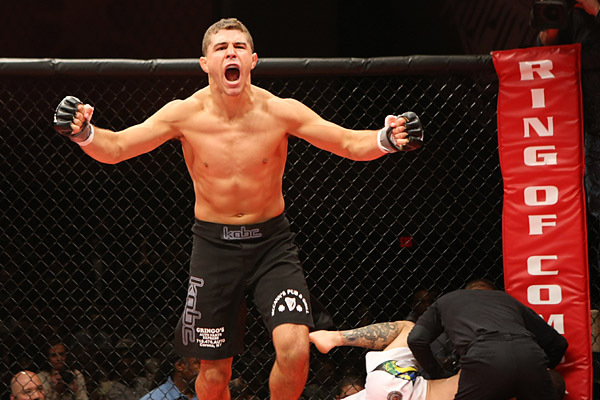 Iaquinta comes in strong following the most impressive performance of his young career against Ryan Couture. On the opposite side Piotr Hallmann enters the bout coming off a great comeback win of his own. Leaving one question. Which fighter best carries that momentum into Saturday’s fight? My money is on Iaquinta. A different song and dance this time around for Iaquinta. Going into his last fight at UFC 164 Al was coming off a year layoff, and had dealt with several different injuries a long the way. This weekend Iaquinta enters his fight against Hallmann coming off a big victory, and more importantly is 100% healthy. In fact Iaquinta was right back in the gym two days later, getting ready for whatever his next challenge would be. That challenge is Hallmann. Although Piotr Hallman may indeed be a challenge I think he’s going to see another level of opponent in Iaquinta. The way Al described his mind set via Newsday earlier this week perfectly describes the type of fighter he is. “When I have a fight, I look towards that date as that’s the day I’m gonna die or something, that’s it. There’s nothing after that. I’m giving it everything I got on that night.” Al explained. It’s that attitude that separates Al from a lot of other fighters. There’s been a lot of talk and hype around Hallmann in regard to his 14-1 record, and his previous win over Francisco Trinaldo. Not to take anything away from Hallmann but that large record doesn’t necessarily give him any distinct advantage over Iaquinta. People get caught up in the numbers sometimes. I’m hear to tell you to forget about the numbers and the stats. When Al Iaquinta enters that cage tomorrow you’re going to see a hungry and motivated fighter who will show you that fight after fight he’s only going to get better. Iaquinta is one of the hardest working, dedicated fighters in the game, and that will become quite clear for fifteen minutes tomorrow night. For Iaquinta there’s no thinking about tomorrow. Give everything you have today and get another “W”. Get excited Iaquinta Nation, it’s Fight Night. Let’s go to war.